I remember it so well, even though it was almost 50 years ago: the World’s Fair in New York City. 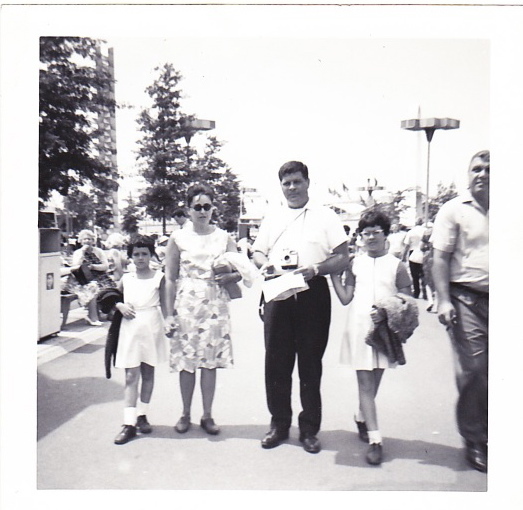 My parents took my brother, sister and I there several times over the two summers it was open in 1964 and 1965. We were all amazed by the rides and the excitement of being there. Almost like being in Disneyland, but much closer to home. My sister, who was 5 the summer of 1964, was in love…in love with one ride only ”It’s a Small World.” She could have sat on that ride all day, every day. The ride was the UNICEF exhibit, and later it would become a popular ride in both Disneyland and Magic Kingdom in Disneyworld. But in 1964 and 1965, it was only at the World’s Fair. I am sure my sister was not the only person to fall in love with both the ride and the song. And I am sure that my parents were not the only parents to buy the 45 record and bring it home for their child. And I am also sure, like any other 5-year-old in the world, my sister was not the only child to play the record over and over and over again. My brother, my parents and I were about to lose our minds. My sister not only played the record, she sang the song constantly, except when we were in school. Then the record was silent and we all had peace. My mother was still not working full time that year. She was a substitute teacher, who stayed home when we were at school. Cleaning, cooking, doing all the things a mom did in the 1960s. So when we came home from school one day, it was not surprising to see our room extremely clean. What was surprising? The record was gone. My sister searched and searched. She finally went to my Mom to ask. And my Mom had a story of woe. While she was cleaning she accidentally broke the record. My sister could no longer play it. In fact it was in so many pieces, she had to throw it out because she did not want us to get hurt. I was so happy. I shared a room with my sister. And I had the worst of the song. I loved my Mom’s cleaning at that moment. To be honest, I did not even feel sad for my sister. Just a sense of profound relief! Fast forward about 10 years. We were living in a different home on the other side of North Bergen. And our house was robbed!!! A burglar had broken in and emptied everything out of my parent’s closet. The room was a mess. Papers and objects were thrown about, on the floor, on the bed, on the furniture. I wish the story would end there. But years later, I became a mother. And I took my daughter to Magic Kingdom in Disneyworld, while my husband was at a meeting. And yes, history does repeat itself. My daughter, then almost three, fell in love with “It’s a Small World.” I went on that ride over and over and over again. It was a drizzly day in November and not many people were there. We could get off and get right back on again. And so we did! But I had learned an important lesson. I did not buy the record, CD or whatever music was available. I could not, would not relive the pain of my childhood of listening to that song one hundred thousand times. And I am not being over dramatic. Each time we returned to Disneyworld, my daughter wanted to go to this ride first. Even my son agreed once he arrived on the scene. So I was doomed. I actually began to like it. I was haunted by the song. And then, almost 20 years after the first time my daughter experienced the ride, she got a taste of what, one day, will be her curse. She was a senior at Drew University in New Jersey. For spring break, she and four friends did not go on a cruise or to Mexico. No they spent a week at Disneyworld. She, of course, wanted to go on “It’s a Small World” over and over and over again. Her friends did not always want to go. She tells this story. It was their last night in Disneyworld. They were at the Magic Kingdom for the parade, and my daughter said, “Hey, “It’s a Small World” is not busy. Anyone want to go?” And they said, “NO. But you can go. We will wait for you.” So she did. She walked down the long ramp by herself. And suddenly a young girl came running down as well. My daughter was surprised. The parents did not come. They sent their daughter on, and looked and waved at my daughter. My daughter was not sure what to do, but she said to the little girl, “Do you want to sit with me or by yourself?“ Oh she wanted to sit with my daughter. And she talked to her the entire ride. My daughter was amazed that any parent in 2004 would let their child go alone a ride with a total stranger. I was not totally surprised. I figure, they were done. No more “It’s a Small World” for them. And there was this nice young lady who would rather miss the parade than lose one last chance on their daughter’s favorite ride. They deserved to be together. And they were. At the end of the ride, the girl’s mother was waiting for her. She ran off laughing and happy! As was my daughter.